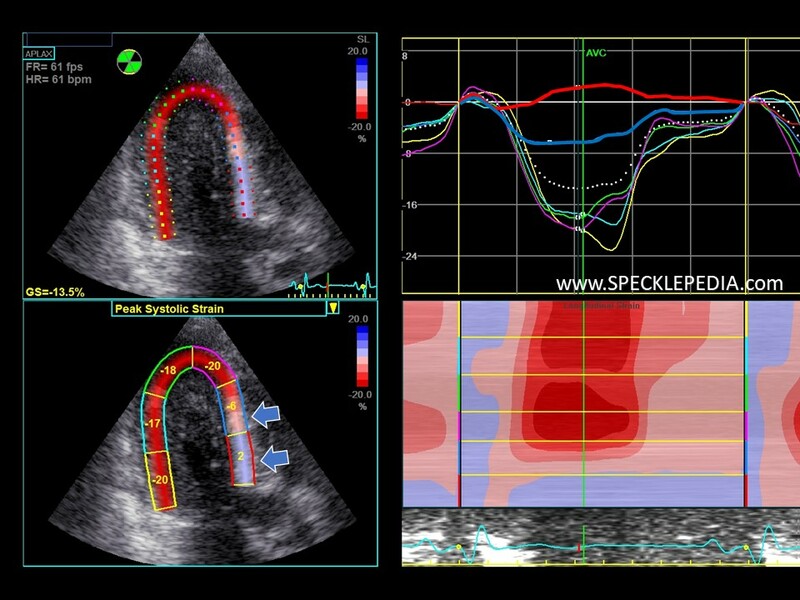 This case shows typical echocardiographic findings in a patient with a non-obstructive hypertrophic cardiomyopathy (HCM). The images are of a 50-60 year old woman who was diagnosed with this disease after family cascade screening. She was found to be a carrier of a pathogenic MYBPC3 mutation. She was asymptomatic at the time of diagnosis, but showed clear findings of HCM on the ECG and the echocardiogram. She is currently treated with B-blockade and received an ICD as a primaire profylaxis. 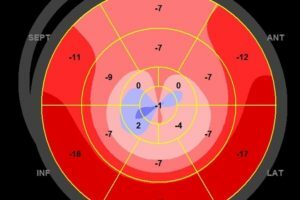 The findings of the echocardiographic examination showed asymmetrical left ventricular hypertrophy with a maximal septal thickness of 24mm and a posterior wall thickness of 9mm. The anterior, and to a lesser extend the lateral wall, also show hypertrophy. The overall LVEF is >55%. 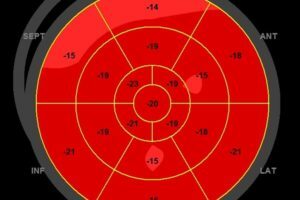 Diastolic parameters fitted with an impaired relaxation with signs of elevated filling pressures (E/E` of 14). There was no SAM and no dynamic outflow tract obstruction. The deformation analysis shows typical findings for HCM. 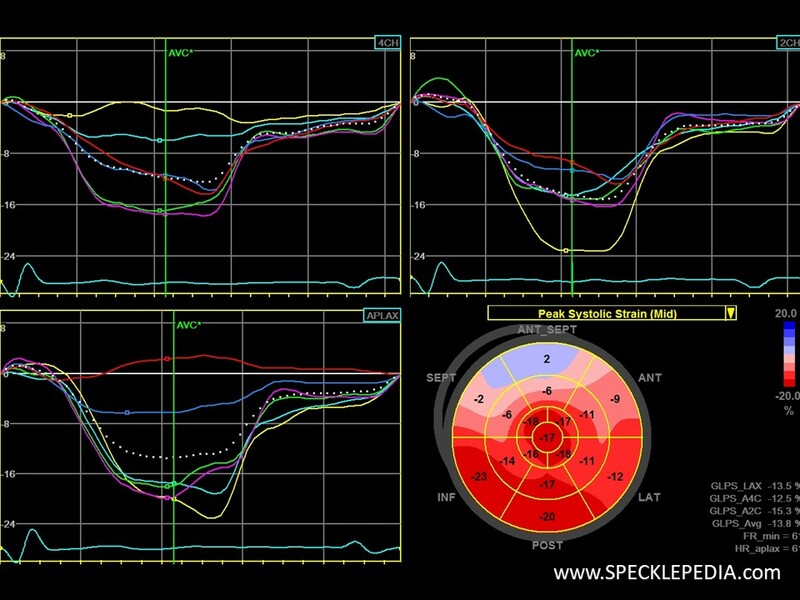 The peak systolic strain is markedly reduced at the basal septal and basal anteroseptal wall (the regions with the most pronounces wall thickness). The corresponding segments are indicated by the blue arrows in the images below. Since this is an advanced disease, there is no post systolic shortening seen. In the APLAX view, the deformation is absent in the basal anteroseptal segement (red graph) and severely reduced in the mid-segment (blue graph). When relying on visual assessment, these regions appear to be near normal with normal thickening during systole (see moving image above). Due to severe myocardial disarray and fibrosis, the longitudinal strain is markedly affected. 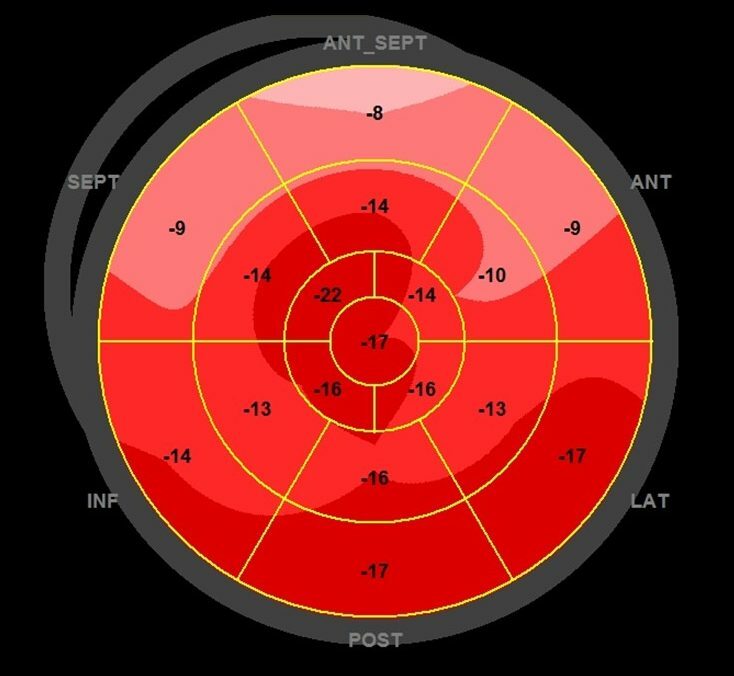 The global longitudinal strain is calculated at -13.8%, which is abnormal (despite the normal LVEF). 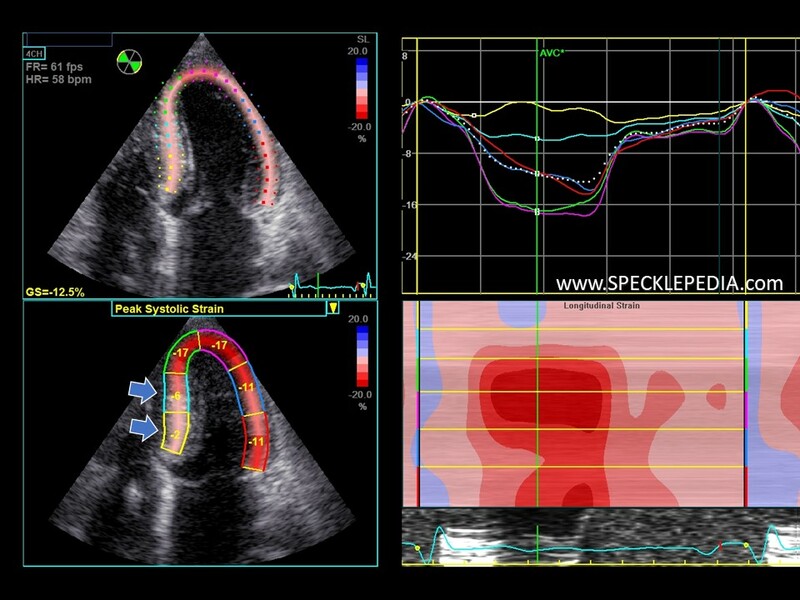 The post systolic index is visible in the basal septal region (not in the basal anteroseptal segment since there is no longitudinal deformation whatsoever). 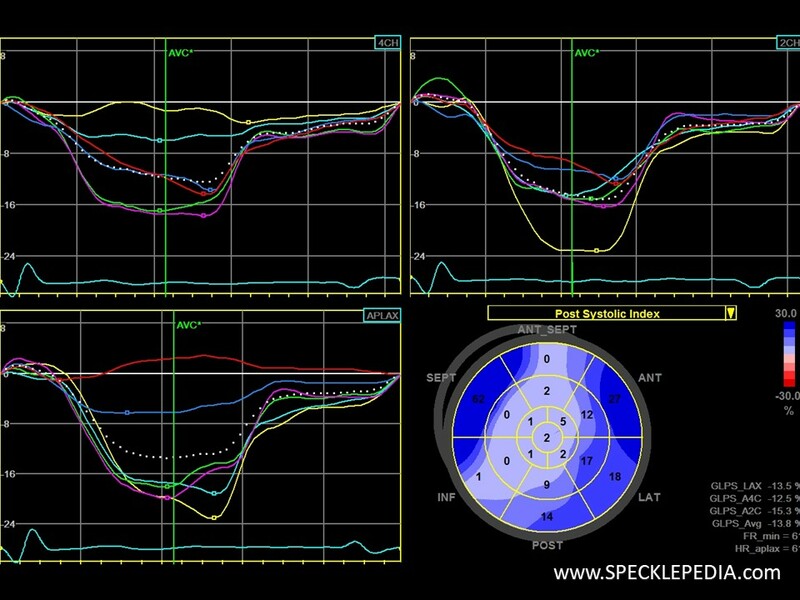 There is also pronounced post systolic shortening in the anterior and lateral segments.